The Marine Corps showed off an ambitious energy project at Miramar on Monday that will allow the air station to operate independently during a crisis. Col. Charles B. Dockery, the commanding officer, said the goal is to be able to operate the 23,000-acre base as an “island” in the event of global military action or a local environmental disaster such as a wildfire. The project includes a new power plant with natural gas and diesel generators, solar panels, backup batteries, generators powered by methane from the nearby landfill, and separate water supplies from the city and county. It’s emerging as a model for other military installations. “When SDG&E goes dark, I’m still launching and recovering airplanes,” said Dockery, who led state and local officials on a tour of the base’s new “microgrid” infrastructure. Marine Corps officials said the goal of the project is to enable the base to operate independently for 14 days. And in such a crisis, the Marines would be able to support local government operations from Miramar. “It builds in redundancy for San Diego itself,” noted Capt. Matt Gregory, director of communications at Miramar. 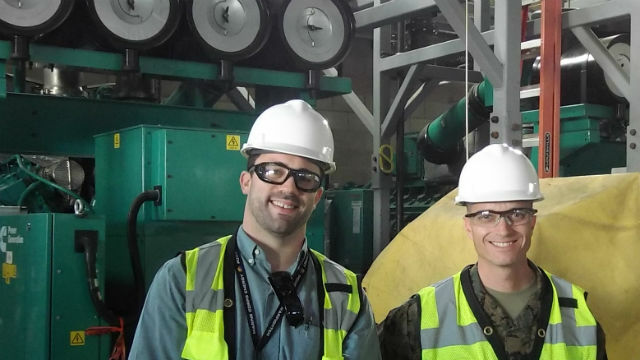 With $20 million in Congressional funding, the Marines have opened an Energy and Water Operations Center on the base to manage sustainable power sources and water supplies. The base’s new power plant is 75 percent complete, a distribution line from the nearby landfill power plant is operating and backup batteries are installed in multiple locations. Dockery said the Marines will soon be testing “island mode” by shutting off power from the Southern California grid and continuing to launch and recover aircraft.